I recently realized that I hadn’t given you my Anti Aging Face Bar Recipe. I’ve been selling it in My Shop for months now and it’s been super popular. I actually put it together at the request of someone who wanted the same or similar oils that I use in my Anti Aging Serum Recipe in a face bar. A good face bar cold process soap recipe is going to account for facial skin’s needs for a more gentle and moisturizing soap bar. I’ve had some soap makers tell me that soap is soap and you can’t make it moisturizing or provide more nutrients and it’s just not true. You can definitely formulate a face bar with a higher superfat value (the amount of oils left over after saponification) so that your bar is not drying to the skin. You can also formulate the recipe so that you are using oils with high vitamin A ad E values, etc. so that you naturally support the skin with the oils that are leftover. 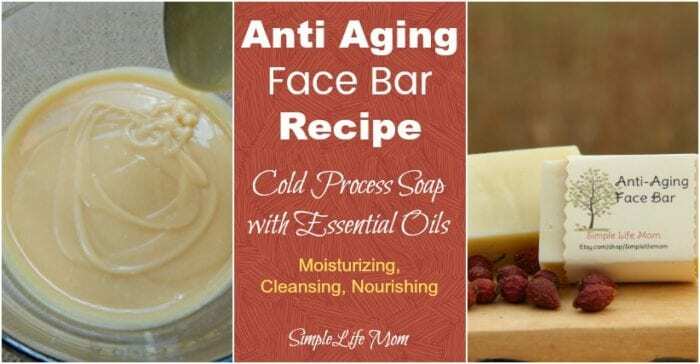 By using the phrase “Anti Aging Face Bar Recipe”, I am not saying I have invented a bar that will reverse aging, but I am saying that it will be more nourishing, gentle, and provide helpful nutrients for young to aging skin that needs extra bonuses from essential oils, vitamin A and vitamin E.
You can learn more about how to make cold process soap here on my blog: 7 Easy Steps to Homemade Lye Soap for Beginners. Or, you can buy my book on Amazon: The Natural Soapmaking Book for Beginners. These essential oils have been in numerous studies that have shown that they have many wonderful properties. I’ve just listed a few of those here to give you a general idea. Frankincense Essential Oil: anti-inflammatory, antioxidant, antiseptic, astringent. Combine olive oil, coconut oil, castor oil, sweet almond oil, cocoa butter, shea butter in a large pot and heat on low until melted. Cool to 110 degrees Fahrenheit. Outside, using a mask, long sleeves, goggles and gloves, pour lye into water and stir until dissolved. Cool to 110 degrees Fahrenheit. Prepare mold by lining if necessary. When both oils and lye water are around 110 degrees F, pour lye water into oils and mix with a stick blender or hand mixer, mixing on and off until light trace. Pour into mold, cover, and insulate for 24 hours before removing and cutting into twelve 4 ounce bars. 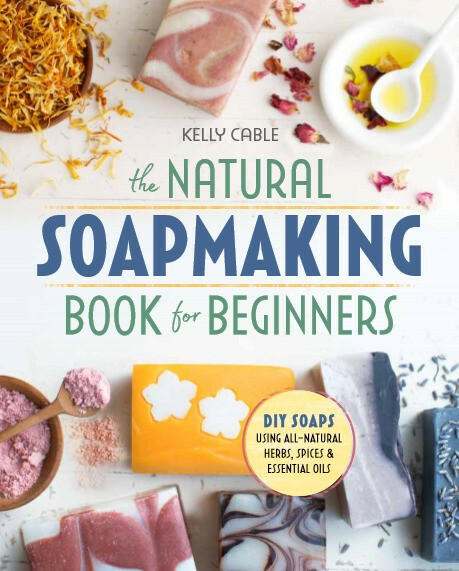 We’re still celebrating the release of my book, The Natural Soapmaking Book for Beginners. THANK YOU AGAIN for all your kind words and encouragement. This has been a great experience. I am loving your book! Thanks! I got your book in the mail and can’t wait to have some time to start making soap! Yes, I’ve made soap before but mostly plain boring soap. Hey, you’re a step ahead of a lot of people. Good for you!! I have never made soap but I really want to. You can definitely do it Vera. I just got your new book and I love it!! It’s so easy to Understand! I can’t wait to get all my supplies together and make my first batch of soap! Thanks for chance to win! I love your products I’ve purchased from your Etsy store. I just need to get enough confidence to try making some myself! It’s like baking a cake. You just follow the instructions. Lye needs to be handled safely, but not feared. You can do it!! Although I have not YET made soap, I have all of the ingredients to do so, and several books on soapmaking, including yours! Just like Tonya, I just need the confidence to go ahead and make it!!! AND the time! 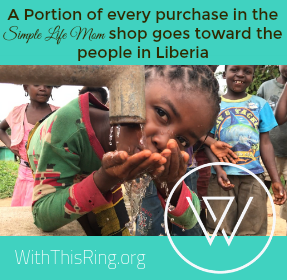 Thanks for the opportunity to win free soap! This will probably be the first recipe that I try! Great catch Carol. Yes, cure them for 4-6 weeks. I always wanted to make my own soaps. Thank you for the recipe and chance to win your book. God loves. I wasn’t looking this just popped up on my screen, thanks a lot. I love making soap for my family. Makes great gifts for any occasion. Thank you so much. They do! Great gifts, and a great way to keep your family a bit more healthy. I am so excited about your book give away. Hoping I win too. 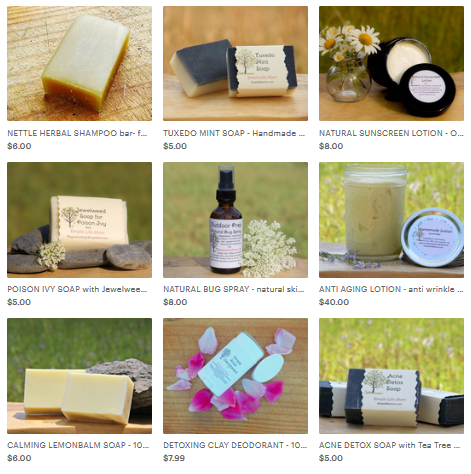 Have never tried making soap–my husband actually did years ago! Because of the lye, he bought old pots/utensils he never used again for other cooking purposes . Looks from your video that you use a sturdy everyday stockpot and stick blender. Do they safely clean up for you to use for family cooking afterwards? I make soap often, so I have separate pots and utensils. If I do use something for soapmaking I will wash it and then run it through the dishwasher. It gets very clean that way. Have your book on kindle but I do so much better with physical copies…thank you for the chance to redeem my mistake!? Me too. I like to have recipe books in hand. I made soap a few times, but so long ago – more than 15 years ago. I’ve been making all of our soap for at least ten years. Your bars are SO much prettier than mine! No way! A simple creamy bar is some of the prettiest soap you can make ? I absolutely LOVE your shampoos and soaps. I used to have very damaged ends and no matter how much conditioner I used, they were as dry and brittle as hay. Your Luxury Shampoo Bar leaves my hair feeling so soft (without being greasy, which is a plus!) and it completely reversed the damage. Thank you!!! I am definitely a customer/follower for life. I haven’t, but I think it would be a lot of fun. Yes I have made soap, all kinds. I made about a 5 years supply and that was 5 years ago. Only have a few bars left (after giving away gift baskets to all my friends and family). So I’m ready to do it again. I want to try your Anti Aging Face Bar Recipe and see what else is in this book. Looks fantastic! Want a wonderful idea make your own soaps from home. Yes, Just check the box (it often shows a picture of it’s abilities). Thank you so much for amazing recipes ! For your Anti-Aging Face soap, do you add the carrot oil with the other oils or with the essential oils? Add carrot essential oil with other essential oils at trace. My daughter had there project on school and she performs this face bar, and guess what teachers were thankful for the recipe because they even made this themselves. My daughter’s project about this anti-aging face bar was perfectly good. I am even using this bar at home, and it saves me bucks. Can I use this recipe for hot process? Actually between HP and CP which one is better when we are adding essential oil instead of fragrant oils? From what I’ve read, Fragrance oils are more difficult to work with in cold process soap. Essential oils work well with both. Both are added toward the end, right before moving your soap to the mold. What’s the superfat % for your anti-aging face bar? Also, if I wanted to use all Shea butter and leave out the cocoa butter, are these interchangeable or would I need more or less Shea butter? The superfat content is at 15%. You can use 5 oz of shea butter instead of 1oz shea and 4 of cocoa. Sometimes a high shea content can make the bar a little slimy feeling, but that would be at 14% of the oil content and I think it should be ok. I attempted the anti-aging soap 48 hours ago, have not cut yet. Still very soft. Should I continue to let it cure. Your thoughts would be appreciated. I’m not sure why yours is still too soft to take out of the mold. Uncover it and wait another day or two. Leaving it in for a few days won’t hurt anything. I’m an experienced soap maker. I want to try this recipe but would like to make the first batch with the essential oils I have on hand. If I leave out the carrot and myrrh, how much of the other EOs would you recommend? Thanks! Just add enough to make up for the ones you left out. I know lavender has many benefits but could I leave it out? I am really allergic to it but would love to try this soap.. not sure if there is a good substitute. Just leave it out. No problem. I made this soap, left it in the mold for a few WEEKS as it was still too sticky to take out. finally I put it in the freezer, it came right out of the mold frozen. after curing for 6 more weeks, it is FANTASTIC! if you are using a silicone mold, it will likely be very hard to get out of the mold without freezing as its 15% superfatted. Wow, I just made more and removed it after 24 hours from my wooden mold, and the silicone mold I remove after 48. I’m glad you sorted it out and that the freezer did the job!! ? What superfat rate are you using? My form is much smaller and I need to recalculate everything. Thank you. I’m making the this soap right now! Waiting for the oil and lye mixture to cool down. Love your soap recipes! For some of your other recipes, can I replace lard with other fat in the same amount? Thanks! Lard and Tallow are pretty much interchangeable. I’d still run it through a lye calculator. I made this soap and it seriously burns when it gets in your eyes. Any idea what would cause this? Hello, I noticed that the recipie is the book differs slightly. For examples, less essential oils are used and apricot kernel oil is used instead. Which recipie is more updated? Thanks! You can use either one you prefer. There’s not a significant difference. Can I use this recipe for a hot process soap? Yes, you can use pretty much any recipe for hot process, just some steps will be different if adding coloring and layers, etc. which don’t apply to this recipe. Hi, I m trying to figure out the cleansing value for mature skin. in your recipe it is 19, the SF is 15. is this for balancing the formula? high superfat and high cleansing value could be similar to normal SF…5% and low cleansing value…10, let s say? thank you! The higher superfat in this recipe is because it is meant for the face, which can easily become dry with all of the washing and wear and tear on our faces. Yes, you do want to balance cleansing with leaving enough oils to not over strip the skin, but there’s more to it than that. The oils chosen can add different vitamins and minerals that can also effect the end result of the skin. Hi, Kelly! Can I substitute patchouli essential oil for the frankincense? Frank and I do not get along. Frankincense is an anti-inflammatory, but yes, definitely leave it out if you are allergic in any way. Patchouli would add a nice deeper tone to the scent.